The first step in creating a well organized and easily searchable UX research database is having a plan for how you are collecting and organizing your raw notes and data… even as you are taking them. Organizing your data and insights as you collect them has several benefits. First, it will speed up user research analysis dramatically. One of the biggest pain points we hear from UX teams is how long it takes to analyze and synthesize their notes and insights after conducting the research. User research analysis is a big deal, and we don’t often spend nearly enough time on it. “It’s not enough to do research, we have to make the research make sense”. I would argue that people don’t do enough analysis and synthesis on their user research because they aren’t setting themselves up to do so easily at the beginning. This is one reason why we recommend organizing your notes, data and insights as you conduct your research. 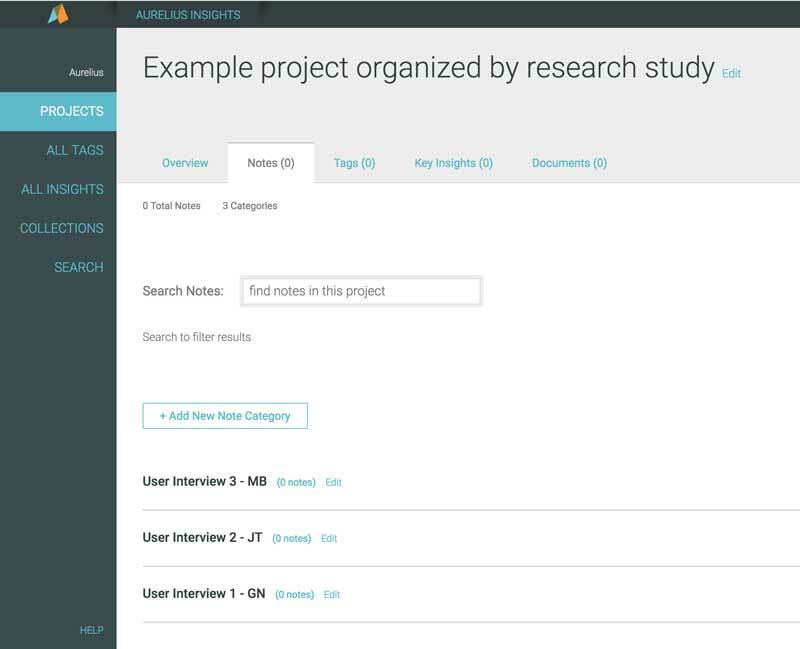 Also, by organizing your user research as you conduct it (or even considering how you’ll do so before starting your research) allows you to easily find and reuse data again later. This means less work for you all around. Not only will it take you less time and effort to figure out what you learned from user research, but it will be faster and easier to have a greater impact when searching for and reapplying your UX research insights later on. Here are some super effective and very common ways to organize your user research as you’re conducting it, or even before, that will help you speed up analysis and findability later. It’s worth noting that we also see folks organizing their UX research using a combination of both patterns. There’s no right or wrong way to do so as it’s really up to what works best for you and your team. That said however, the most common pattern we’ve found is organizing research projects by study as it tends to be the easiest choice in the moment and those doing the research (UX and product teams) often remember the “effort” or “project” more than they recall the product, feature, etc. There are advantages to organizing your projects using either pattern, but consider what will be most useful for you, your team and even those not immediately involved in the initial research in order to search and find those projects again later. Doing so will help you make a more informed choice in how you decide to organize your UX research projects. Next, it’s important to build consistency in how you organize and structure your actual notes and data in each research project. What I’m referring to here specifically is where you’re collecting the notes and data within the project itself. This can be separate note documents, spreadsheet tabs or actual note categories like we’ve built in Aurelius. No matter the tool, you should have a consistent pattern for what you label each set of notes and data and when to create a new group or category. Again, we’ve found a few common patterns in our time working with customers in Aurelius. Each pattern mostly relies on how you’ve decided to organize your projects themselves, either by research project or product/feature/team. Let’s have a look at each. Repeat as necessary for the number of interviews, usability testing sessions, etc. As you can see in this example, if you organize your user research by product, feature, team or department, your note categories will change slightly. In this case your best bet is to group the notes and feedback you collect by the source. This is useful later for when digging through past data and you want to know where that note or insight came from. That quote is from a real Aurelius customer (at least before they used Aurelius). Don’t fall into this trap where doing a whole new research study is faster and easier for you to get answers to questions about your customers. By organizing your user research data and insights up front and as you conduct the study, you’ll save yourself loads of time and effort later. Once your research projects are all organized, you’re ready to organize the most important part of the entire user research process, key insights. Key insights or UX nuggets are those things you share to communicate what you learned from user research. Creating key insights is a more effective way of sharing research knowledge in a more digestible way than a traditional report. We’ve written about how and why to create a system of key insights or “nuggets” in greater detail in other articles, but a quick refresher here is useful for context. While there are certain times and situations where a research report may make sense, overall they are a fairly ineffective tool. 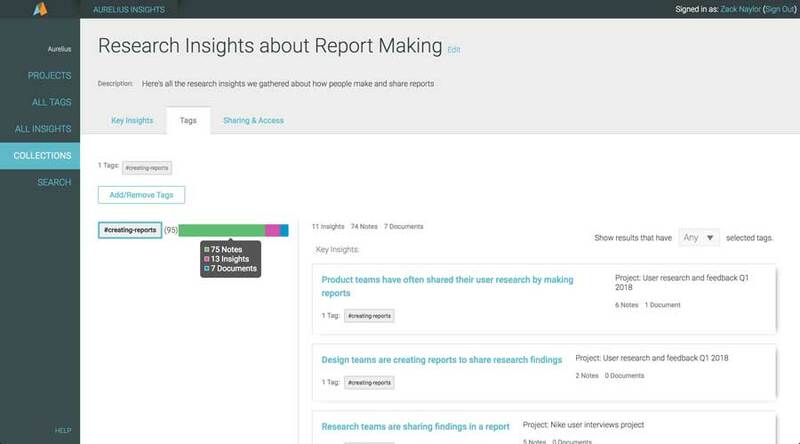 In terms of most effectively storing your user research findings, building a central repository of key insights filled with rich detail and tagged has the greatest long term impact. The reason is because it’s easier to search and find bite-sized findings rather than a research report deck or presentation. Key insights are the answers to the questions your user research project asked. You’ll often have more key insights from a research project that didn’t answer the immediate question(s). This means you’re often not sharing those extra findings in a research report. Those additional key insights then get lost and aren’t findable or reusable at a later time. This is a tricky subject in and of itself. While there’s a lot of thought and intelligence others have shared on the subject, I wanted to address it here specifically regarding key insights. It’s important to tag your key insights in the bigger picture of storing your UX research because of how powerful it is to increasing findability after the initial project is done. Further, tags often serve as a way to add richer detail and context of what a key insight is about. We frequently find that when someone is beginning to search for past research insights, they tend to start with a broader topic or theme to review first. In this case tags are extremely effective at categorizing research findings to quickly find and review in a broader UX research repository or database. The final step in organizing and sharing your user research is...sharing it. While that seems pretty self explanatory it’s deceptively more complex than that. But if you’ve created a central library of user research organized in the way I’ve suggested it’ll be a whole lot easier. Again it’s worth noting that you may choose a combination of these above strategies to group and share your user research insights. 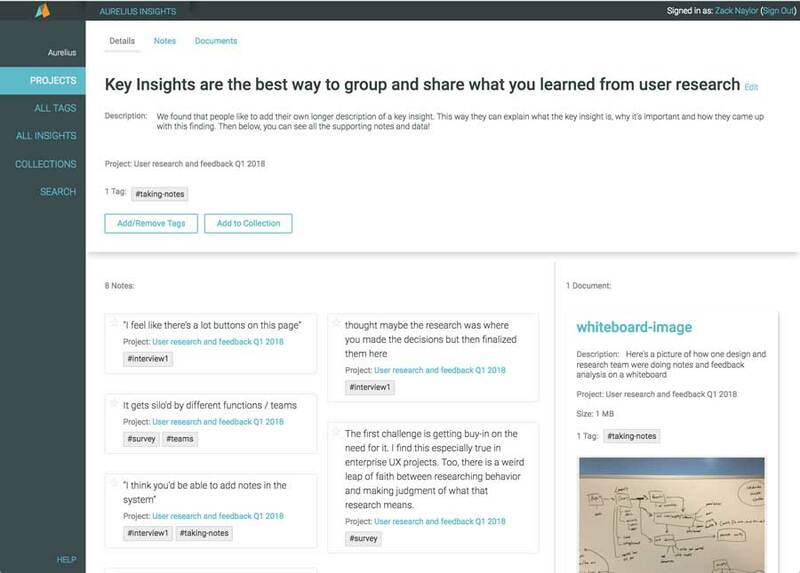 The beauty of organizing all your user research projects and key insights (or nuggets) in the way I recommended above is that now you have the ability to construct new groups of research findings in a way that best fits you at any given moment! Once you have a group of research findings or key insights, you’ll want to be sharing them with folks so everyone can make more informed design, product and feature decisions. Traditionally a lot of people have made PowerPoint decks or some other sort of designed presentation in order to share their research findings. This is increasingly becoming less common to share long form reports in big formal meetings. In short, people are simply finding it less effective and not worth the time. Creating a user research report to answer the initial questions of the study may be a necessary evil for the time being, but they often take too much time and effort when your goal is to reshare, or share new information, from past studies. Individual research projects often answer multiple questions that aren’t in the scope of the study at the time. This is why having a smart system to capture, organize and search all your past data and key insights is critical. I bet those questions sound familiar. Having a user research repository of well organized projects and groups of key insights in an easily searched place helps you answer those questions almost effortlessly. A user research repository is more like a vitamin than it is a pain killer. You may not feel the immediate effects now, but you’ll be sure glad later that you started with smart way to organize and store all your UX research in this way. Now you have a kit of Lego blocks to build and construct new knowledge from past studies with far less time and effort. A major tip for effectively sharing your user research findings can be taken from Gregg’s quote. Meet people where they are. If you work in the digital world, there’s almost a certain chance you use email. When sharing the research data and findings, be direct and answer the questions being asked as concisely as possible. We’ve found that sharing high points from current and past research (key insights) over email and then scheduling an in person meeting as a follow up only when necessary is the most effective approach. Most of the time when we’re creating beautiful research reports, we’re serving our own needs to make something cool. Serving the needs of those who are consuming our research is doing whatever best communicates our findings in a way that makes it easy to understand and act on. This is particularly why we built our Collections feature and its sharing ability the way we did in Aurelius. 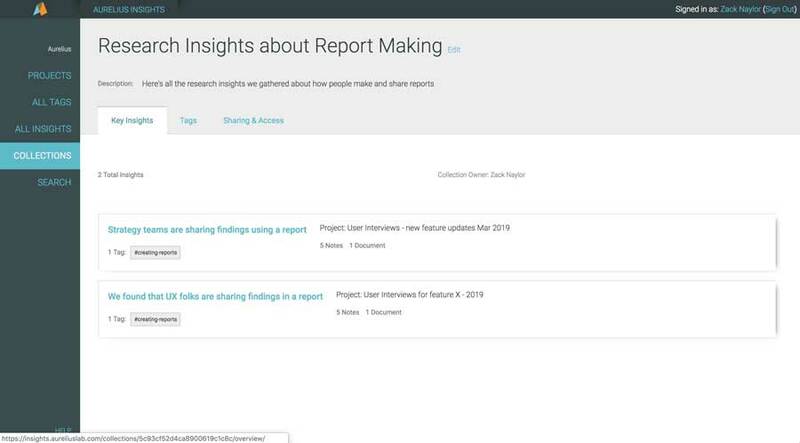 As you can see, you can quickly search across all research projects, choose key insights you want to share and even attach a tag to show all your raw notes, data and documents in that Collection. From there, sharing is simple as you can add the person’s email address and they get sent an email to a read only version of the Collection and they don’t even need an Aurelius account. Working in this way allows you to rapidly search and share research findings. Even better, that Collection will automatically stay up to date with any edits or additions you make, meaning you don’t have to go back and update any slide decks or presentations… meaning even less work for you! 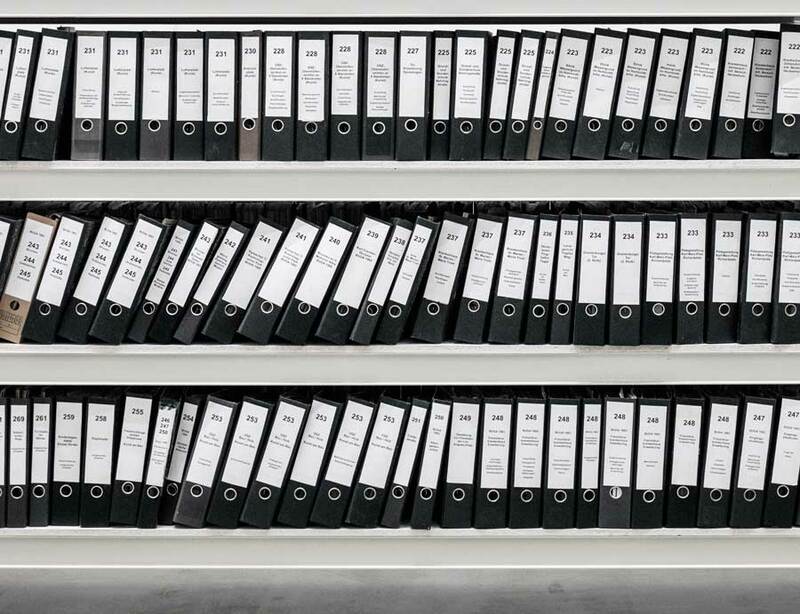 Storing UX research can be a frustrating situation if you don’t have a strategy for how to organize and share your key insights and findings from the start. Following the three step guide we shared here will give you a great foundation to save a whole lot of time and effort when it comes to organizing your user research data. Most of our advice comes directly from our experience working with UX researchers and product teams just like yours in building our very own user research platform, Aurelius. 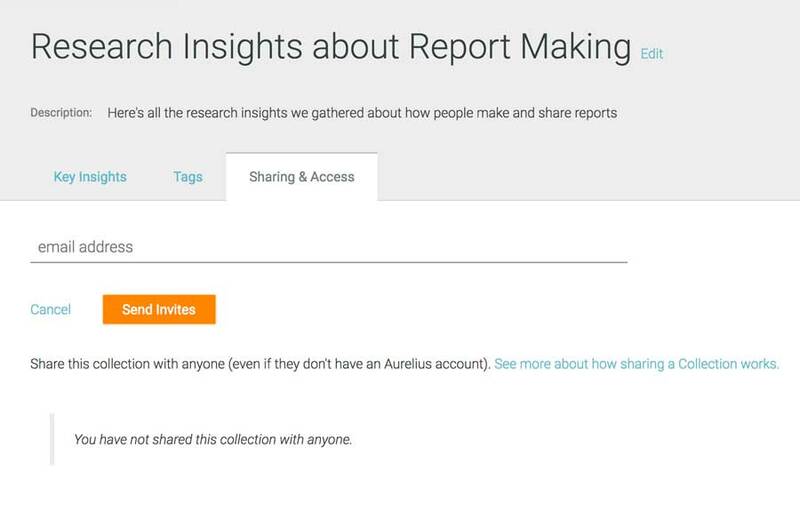 If you’re trying to tag, organize and share all of your user research in one place, we invite you to check out Aurelius. Check out a demo video here . Or even better, try it yourself free for 30 days .